Officials with the South Carolina Department of Natural Resources (SCDNR) would like to advise all hunters and shooters who utilize the shooting range at Palachucola Wildlife Management Area (WMA) that the facility will be closed for maintenance and repairs beginning December 10. The Palachucola range has been a popular addition to the SCDNR’s managed lands programs since it opened in 2004, attracting hunters and shooting enthusiasts interested in sharpening their skills since from around the region since its opening in 2004. The range has not been closed for any significant amount of time during the intervening 14 years, and parts of the facility are beginning to show their age, according to April Atkinson, the SCDNR biologist who manages Palachucola and the nearby Webb Center and Hamilton Ridge WMAs. Some work to ensure that the facility continues functioning safely and efficiently was in order. Unfortunately, the work beginning on December 10 will require that the range be closed while maintenance and repairs are underway and remain closed until the work has been completed. 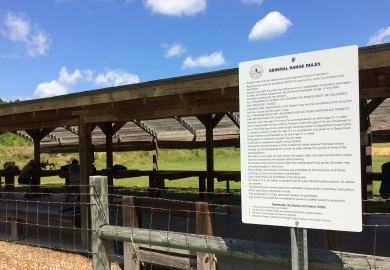 Notifications to local and regional media, and via the SCDNR website and social media pages, will be made once the range is ready for visitors again. A complete list of public rifle ranges and commercial ranges in the state can be found on the SCDNR website at http://www.dnr.sc.gov/shooting/rangemap.html.